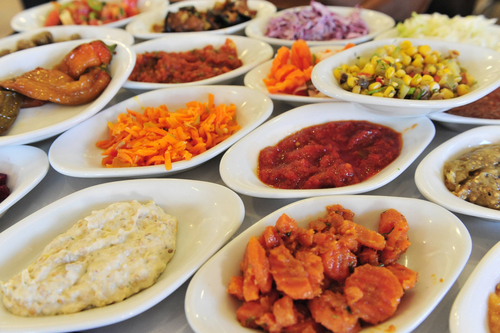 Israeli Jewish traditional food come from a blend of different cultures such as the ones from Middle East, Mediterranean, Spain, Germany and Eastern Europe. Israeli Jewish traditional food come from a blend of different cultures such as the ones from Middle East, Mediterranean, Spain, Germany and Eastern Europe. Inside these different cultures it is found a difference between Ashkenazy and Sephardi culture. Ashkenazy food convey the North-East European influence due to the cold weather conditions that induced people to choose as basic ingredients potatoes, bread, meat and pickled food usually with sugar or honey. Sephardi Jews coming mainly from Spain, Portugal, Morocco, Turkey and Italy, due to the sunny climate, made use of fresh vegetables, fish, olive oil and spices. It is possible to notice the difference in the main dishes of the traditional Jewish cuisine such as the slow cooked beef stew for Shabbat, Chamin ( that in Hebrew it means “hot” ) in the Sephardic tradition where the whole wheat grain is cooked separately in cheesecloth bags and chicken is used instead of meat, with the addition of chickpeas, rice, hard boiled eggs and spices; Cholent ( Schalet in Yiddish ) in the Ashkenazi tradition where meat, potatoes, beans, barley and kishke are cooked together with only salt and pepper. The traditional braided bread, the Challah, that is common to both the cultures and it found on the Shabbat and holidays tables, is differently baked in the two traditions, where the six strand Ashkenazi Challah is recognizable for the presence of sugar and eggs into the dough. In the Sephardic Challah spices, honey and olive oil are employed. Inside the Ashkenazy tradition we find the bagel, that is a donut shaped bread, usually served with cream cheese and salmon, and the famous Gefilte fish ( in German means “stuffed fish” ), a dish that is a basically a mixture of different kind of fishes, usually sweet water fishes, that are boiled, smashed and mixed with spices, eggs and vegetables; it is a typical entrance course that is served with carrots and horseradish. 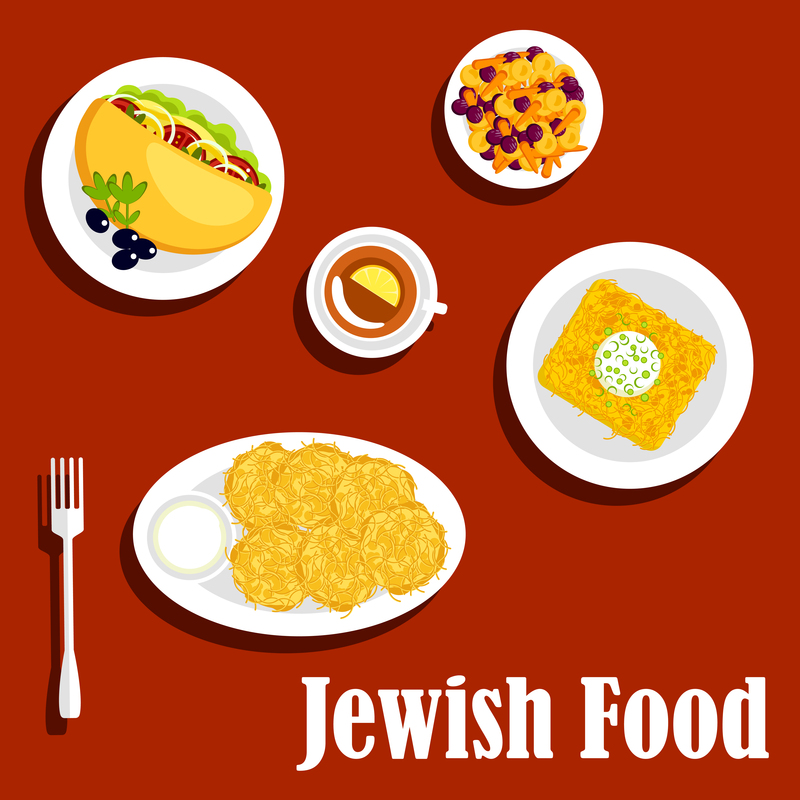 Other Ashkenazi dishes are the Vorschmack or chopped herring, made of herrings, eggs, onions and apples, the Strudel, the Kugels, the chopped liver, the Holishkes (stuffed cabbage), the Tzimmes that is made of carrots, sweet potatoes, sugar, honey and dried apricots. In the Sephardi tradition there is the employment of a lot of spices and aromatic herbs besides the large amount of vegetables and fish. Among the spices the most used are cumin, turmeric, saffron and cardamom, among the aromatic herbs fresh mint leaves, fresh cilantro and parsley. Sephardic delicacies are the Bourekas, that are phyllo dough or pastry crust pastries filled with meat or cheese or vegetables such as potatoes or mushrooms, the Sambusak that is a semicircular pastry filled with hummus ( smashed chickpeas ), fried onions and spices. Other Sephardi specialities are couscous, falafel, hummus, kibbeh, fried fish, tabbouleh and tagine. 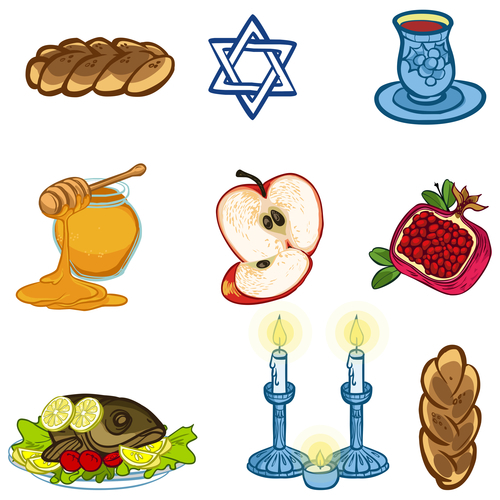 On Shabbat in both the traditions the common dishes are the chicken soup, the cholent or chamin, and the challah. The Ashkenazi Shabbat meal includes roast beef, pot roast, chicken, the tzimmes and the potatoes; the Sephardic one includes mainly salads, the stuffed vine leaves (Sarma) and couscous. Both Ashkenazi and Sephardi Jews don’t mix meat and milk, eat kosher meat and don’t cook on Shabbat using some techniques to keep warm the food by means of the use of slow cooking pots and the plata. Regarding the meats the Ashkenazi prefer beef, duck, goose and schmaltz fat, the Sephardi use beef, mutton, chicken and oil. In both the traditions the usual Friday night Shabbat dinner starts with salads and a fish course that for the Ashkenazi tradition is represented by the gefilte fish and for the Sephardi tradition by the North African hot fish, followed by the classic chicken soup and a meat or chicken dish. 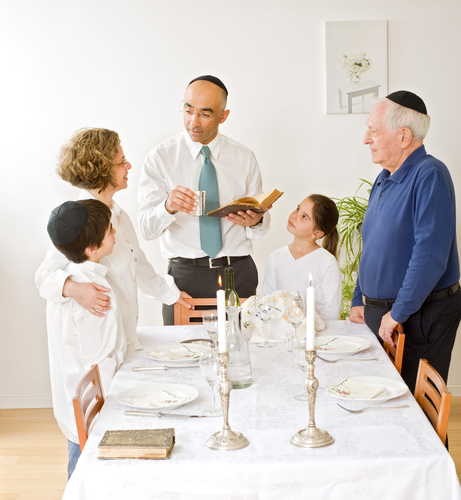 On Shabbat day the main course is the cholent or chamin usually cooked slowly in a crockpot. The meals usually end up with a dessert that cannot contain milk nor other dairy products, that on the Askenazi tables is the babka, rugelach and strudel, on the Sephardi tables is the baklava, halva and ma’amoul, besides the apple cake that is common to both the traditions. In the Jewish festivals particular recipes are prepared, for Hannukah the typical food are the Latkes, that are potato pancakes and the Sufganiyot, round fried doughnuts filled with fruit jelly. On Purim the Hamentaschen cookies are baked using chocolate cream or date jam, on Passover the most typical food is the Matzo Ball Soup, a chicken or vegetable soup with dumplings made of matzah meal, eggs and water. On Shavuot most of the food is based on dairy ingredients, so a lot of varieties of cheesecakes are usually baked. On Rosh Hashanah in both the customs the round challah and the honey cake are present on the tables, with the difference that in the Sephardi families the sweet roasted pumpkin burikitas or fried pumpkins with sugar are served besides the leek and chard latkes, and in the Ashkenazi families tsimmes and the brisket with prunes.